Warm a large, non-stick frying pan over a high heat and fry the mince until browned, stirring occasionally. Add the chilli and stock to the pan and cook for 10 minutes, stirring occasionally, until the liquid has evaporated. Stir in the lime zest, juice and fish sauce. 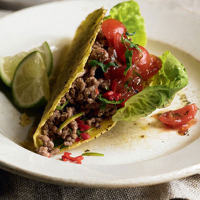 Pile spoonfuls of the beef with the lettuce leaves into the taco shells and serve with tomato salsa, or soured cream and lime wedges.